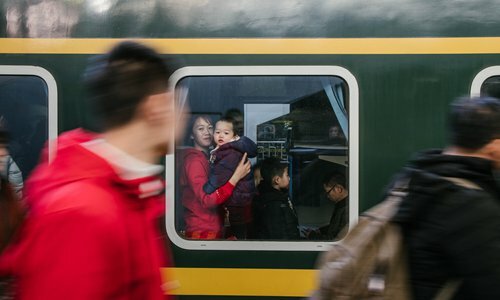 The Spring Festival travel rush started Monday, unleashing China's largest seasonal migration of people as families reunite for the most important traditional holiday. The travel rush began 15 days ahead of the Spring Festival , which falls on February 5 this year. From January 21 to March 1, nearly 3 billion trips will be made via China's transport system as people set off for family gatherings or tours. China's public transport system has introduced new technology to increase efficiency during the travel rush. In South China's Guangdong Province, some railway stations have pioneered "ticketless travel." Starting on Monday, passengers can simply swipe their smart phones to board the inter-city high-speed railway connecting the provincial capital of Guangzhou and the technological powerhouse of Shenzhen. Instead of buying tickets online and collecting them at the stations, travelers can pass ticket checks by scanning QR codes. Huang Xiaozhong, a deputy chief of the East Guangzhou Railway Station, said passengers can register the application via Alipay and get a QR code, which is valid for three hours. "The QR payment only takes a few minutes, compared with 20 to 30 minutes for passengers to purchase, pick up the tickets and enter the station in the traditional way," said Wang Lihui, who is in charge of the station's ticket sales office. In Shanghai Municipality as well as Jiangsu, Zhejiang and Anhui provinces in East China, 464 ticket checking machines in railway and coach terminals allow swift passage with facial recognition technology to verify passengers. Ctrip, China's leading online travel agency, forecast that some 7 million Chinese will travel to more than 500 destinations in 90 countries and regions during the upcoming week-long Spring Festival holiday. Shanghai-based online travel agency Lvmama has predicted that prices for domestic tours will surge by 30-50 percent during the Golden Week travel period, and those for outbound tours will be 10 percent higher than off-season prices. Agencies including Ctrip and Lvmama said that 70 percent of Chinese will travel with family during the Spring Festival holiday, prompting hotels to upgrade facilities and services to attract family travelers. On the first day of the travel rush, Hoang Tuyen, a Vietnamese national doing business in Southwest China's Guangxi Zhuang Autonomous Region, took the Nanning-Hanoi international train to return home. "The train service has become the first choice for Vietnamese traveling to China," he said. The announcements on the train are made in both Chinese and Vietnamese. Chinese attendants on the train can speak Vietnamese and English. The train service on the 396-km long railway, which opened in 2009, is China's second international train service, following the Beijing-Moscow route. Wei Feng, the train conductor, said the route will add two more train cars to cope with the increased passenger flow during the travel rush. More than 100,000 Vietnamese nationals are working in the border cities of Pingxiang and Dongxing in Guangxi, as manufacturing enterprises in the border region offer many jobs. The Spring Festival travel rush arose in the 1980s after rural laborers flocked to big cities to find jobs amid urbanization in China. They had the time and money to go back home once a year for the Spring Festival family reunion. 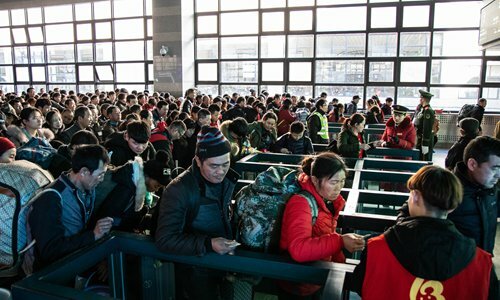 Wang Zhenghua, the founder of China's largest low-cost carrier, Spring Airlines, recalled people standing in a queue as long as one kilometer in front of the ticket booth in Shanghai's railway station, hoping to get a ticket home ahead of the festival. "Few people splurged on air tickets to go home when I set up the airline in 2004," he said. However, tickets for round-trip flights during this year's travel rush were booked up three to four months in advance, even though airlines added 1,600 flights to cope with the travel rush, Wang said. The travel rush has typically been an exodus from cities ahead of the festival, followed by a post-holiday flood of workers into cities. The sharp demand drives up ticket prices. However, a reverse trend has emerged, with a growing number of family gatherings in big cities as urban workers have found tickets for trips from their hometowns to big cities ahead of the festival are much cheaper. Zhang Lan, who worked at a service center in Shanghai, said her parents will fly from Southwest China's Chongqing Municipality to Shanghai to join her during the Spring Festival. "If I fly back home to Chongqing, I will spend at least 3,500 yuan on tickets. But it only costs 2,400 yuan for both of my parents to come here," she said. She plans to work during the holiday to save some days off for vacation later. In her spare time, she will take her parents sight-seeing in Shanghai. Currently, China's fast-developing transport system cannot satisfy all the demand from homebound travelers. Wrapped in a cotton-padded jacket, waterproof coat and carrying bulging bags through the pillion, Pan Nanxiong, 56, joined fleets of motorcyclists from the economic powerhouse of Guangdong to neighboring Guangxi on Monday. This was his sixth trek on a motorbike to home during the Spring Festival travel rush. His home in Yangmei township is more than 400 km from where he works in Guangzhou. "Neither bullet trains nor coach services can bring me home directly. The motorbike ride is still the cheapest way for me to go home and avoid transfers," Pan said. After a brief break at a rest stop in Guangxi, where he was offered hot ginger soup and bread, he resumed his freezing and tedious journey. The "motorbike fleets" emerged as more quality roads were built. But the number of fleets has reduced since last year. The rest stop where Pan stopped used to provide maintenance for 4,000 motorbikes a day as the travel rush began. This year, it only expected to receive a few hundred a day.